This article by Lucy was first published on bloggingshakespeare.com, the Shakespeare Birthplace Trust website. Playwright Lucy Nordberg interviews Professor Jessica Winston, Professor of English and Chair of the History Department at Idaho State University, and author of Lawyers at Play: Literature, Law, and Politics at the Early Modern Inns of Court, 1558–1581, published by Oxford University Press (2016). 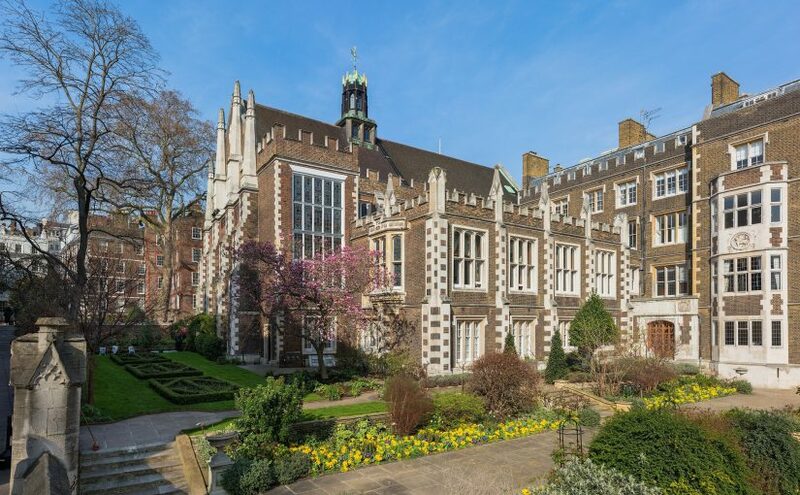 While researching Elizabethan playing spaces, I recently investigated the history of Middle Temple Hall in London, the site of the first recorded performance of Twelfth Night on 2nd February 1602. Virtually unchanged since its construction, the ornate oak-panelled Hall overlooks the Thames and contains curiosities including a piece of Drake’s ship the Golden Hind and a 29-foot table carved from a single oak, said to be donated by Elizabeth I. But this is far from a museum. Aside from all its artefacts, the Hall has an unbroken line of practical and intellectual use dating back to its inception. As one of the four ancient Inns of Court, the professional associations for barristers in England and Wales, it continues to provide education and support to new members of the legal profession. Of course, there are some differences now. You can pre-book lunch at the Hall, alongside the students, bench members and barristers, but besides the odd heated discussion you probably won’t witness arguments overspilling into violence, as they did in 1598 when future poet, MP and lawyer John Davies cudgelled fellow student Richard Martin on the head. This was, it can easily be imagined, a more swashbuckling age. New traditions, ventures and ideas were forged here. The legal profession itself was being defined. And in the entertainment of the day, new plays were finding a way to articulate ideas about human nature. I was particularly curious about how aspects of the Hall’s history reveal connections that exist between law and Elizabethan drama. In the course of my work, I had made contact with Professor Jessica Winston, a specialist in Shakespeare and sixteenth-century literature, who has recently written a book on literature, law and politics at the early modern Inns of Court. Jessica kindly agreed to be interviewed when visiting the UK, and we met at the British Library, where she was conducting research. Lucy Nordberg: In 1602, a legal student, John Manningham, wrote in his diary about the production of Twelfth Night at the Hall. He gave it a good review. Can you tell us little about the Middle Temple audience and what would make them so receptive to Shakespeare? Jessica Winston: Although Manningham was something of an ideal spectator, the audience would have been fairly diverse in terms of age and level of affiliation with the Inns of Court. There could have been junior members, barristers, readers and the Governors of the Inn called the Benchers. But junior members at the Inns were especially fond of playgoing. There are references in the period to the Inns of Court Man, who was never a student and who spent all of his time at the plays and bearbaiting in Southwark. So in that sense, the lovers of plays would have been part of the Twelfth Night audience. The kind of men at the Inns of Court around 1600 – but especially at the Middle Temple – often wrote poetry, and were often mean spirited with each other as well as witty. LN: You give a good description of them having “a similar fondness for witty, biting satire and they had similar personalities, often characterised by volatile tempers and intellectual and egotistical discontentedness with society and the follies of others.” So they would have been sparring with each other in a sort of almost playlike way, with drama going on amongst themselves. JW: Yes, and in that sense even something like the shaming of Malvolio, which is often taken to be a satire on Puritans, in its meanspiritedness could also have been appealing to the audience. LN: Manningham points that out, doesn’t he, and says he thinks that part of the play is done well. Overall, it seems there is a big connection between the legal and the literary professions, especially at that time. How did that come about? JW: As with any historical phenomenon, the answer is multifaceted. For a long time, scholars have hypothesized that the Inns of Court were literary centres because of geographical location and institutional context, attracting young fairly well-to-do men who were also well educated. They had a lot of time on their hands because there was no required schooling. LN: Yes, that interested me, the idea of having a place where people gathered who could create things that weren’t necessarily connected to what they were prescribed to do. They had the space to be able to explore other areas intellectually. JW: Yes. To many of us nowadays that seems strange, considering how prescribed the programming is – at least in an American university. It’s very odd to think that there would have been so much space and time, where you don’t have to do anything except maybe attend some moots and dinners. And if you don’t do those few things, you only have to pay a fine. A way to think about the Inns of Court is as liberating, intellectual spaces. That’s part of the answer, although in my book I also tried to show that the Inns of Court are not always a literary space. That literary energy gets activated in particular decades. So, in the 1560s and in the 1590s, there’s an increase in the literary activity associated with the Inns and that has to do with changes in the legal profession. The Inns existed first and foremost as legal societies and law schools. Even though up to about 85 percent of the men admitted to the Inns did not become barristers, many did aim to become legal men in a larger sense: they went on to govern their own estates, to serve as local Justices of the Peace, or to work in other civic positions, such as town recorder, and in this sense the law nevertheless mattered to members. In the 1590s the legal profession consolidated in London, but there was not a good sense of what exactly a lawyer should be, what his ethics should be, how he should treat people personally and professionally. There are all kinds of comparisons in the literature of this period from people like John Davies between ‘lawyers and whores’. Many writers at the Inns were also using their biting satire and wit to consider what it meant to be a representative of the law. Even if they didn’t want to be lawyers, it mattered to them to consider: ‘are you doing the right thing?’ The culture of personal shaming and wit was, I think, also about policing or trying to come up with a certain idea of what a lawyer should be by shaming men for acting in ways that lawyers shouldn’t act. LN: Middle Temple itself is often mentioned in literary works. How does Shakespeare mention it and does this tell anything about Middle Temple’s significance to the wider public at the time? JW: Shakespeare’s most famous mentions Middle Temple is a scene in 1 Henry VI in the Temple Gardens. That’s the scene where the factions of York and Lancaster sow the seeds of civil war. When they pluck the roses in the garden, one takes a red rose and one takes the white rose so there’s a kind of national mythmaking going on. But it’s interesting as well because Shakespeare uses that location ironically. It’s a garden at a law school, so a place you would associate with an ideal pastoral world, with a natural order, and with law. And yet here is a scene where these men ultimately disregard the law, so Somerset says: ‘Faith, I have been a truant in the law / And never yet could frame my will to it; / And therefore frame the law unto my will’ (2.4.7–9). So law is perverted by personal will. The irony might suggest that Shakespeare is perhaps idealising the Inns. But it could also suggest that he’s not. That he’s actually associating what’s happening in the garden with the reputation of the Inns of Court as a place where the law is made—and perhaps shaped in ways that are affected by personal, human elements. LN: There’s another connection between law and drama. A dramatic situation comes about when two sides are pitted against each other. A court case and a play have both a human and logical elements. And I wonder if a particular style of drama might come from a time when people are creating the means of working through ideas in certain ways. JW: True. So there’s an even more fundamental connection. There’s some wonderful work by the author Lorna Hutson who argues that legal rhetoric, based on Quintilian, was of course the way that young men learned to argue anything, in any sort of rhetorical context. That’s the way you’d learn the art of rhetoric in school. But she demonstrates how that style of argument influences how scenes are plotted in Shakespeare’s plays, and also how Shakespeare makes places and people seem real by including references to circumstances (times, places, and persons), in ways that can be traced back to Quintilian’s rhetorical guidelines. So a play like the Comedy of Errors – an Inns of Court play – sets up ideas about eyewitness evidence and how you draw conclusions from what you see, which of course is also something that Twelfth Night plays with. LN: It also brings to mind John Donne – also connected with the Inns of Court – in the poems where he uses the learning of the time to win over a lover. Poetry brings together logic and feeling as well so it seems that it stems from a particular mindset. JW: Absolutely. Also, a good rhetorician will know how appeal to the emotions, among other things. So it’s important to understand when to do that and how to do that – both as a lawyer and as a writer. One related note about Twelfth Night is that, like the Comedy of Errors, it’s a story about someone who arrives in a new place who’s completely unknown, someone who has to make their own identity in that place. A Comedy of Errors is perhaps more obviously relevant to the Inns of Court context, expressing the idea that ‘who you are’ is malleable. The future could be yours, but what is going to happen to you is always up in the air and not solely dependent on your actions, but also on the people around you. You know, not everyone wants to see Viola marry Orsino at the end of Twelfth Night. But to the extent that there is this trajectory of developing towards a sort of mature self, the play contains the idea of malleability of identity and the sense of developing into something. I think that would have appealed to Inns of Court men too.